We would love for the community to come out and support the band like they do the football team as the band is the largest organization at the high school and is always there to support our boys. The MPHS Goin’ Gold Band is hosting the Northeast Texas Marching Festival on Saturday (Oct 13) from 9:00 am until 6:00 pm at the Sam Parker Stadium. The cost is $5 for a full day of entertainment from 18 bands from across East Texas. The money raised goes back into the band program and we want to make sure the whole community comes out to support our Goin’ Gold Band. The Mount Pleasant High School Cross Country Teams competed at District on Monday, October 8, with both Varsity teams advancing to the Regional Meet. The Mt. Pleasant Varsity Girls Cross Country team took first place for the fourth year in a row. The Lady Tigers finished with a score of 36 while 2nd place finisher, Royse City, had 46 points. 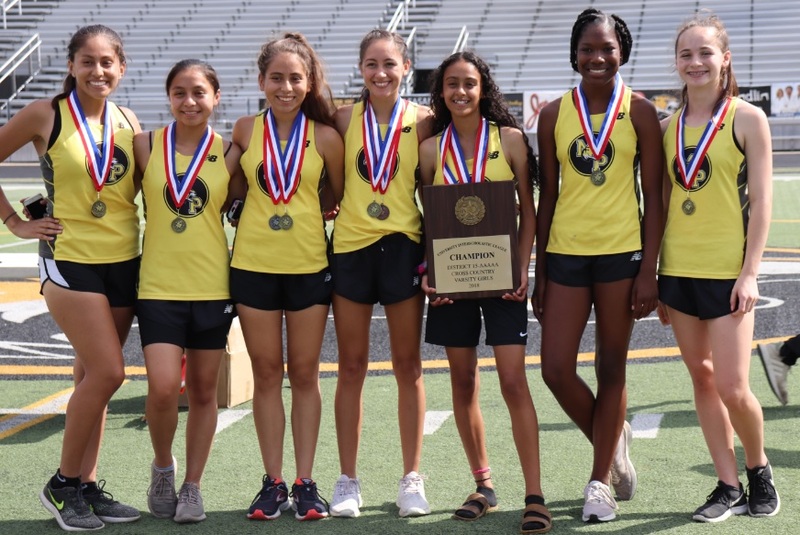 Placing individually for the Lady Tigers were Estela Dorantes (Jr.) 2nd place, Martina Ramirez (Sr.) 3rd place, Christina Gordon (Jr.) 6th place, Katherine Ochoa (Fr). 11th place and Paula Flores (Sr.) 14th place. The number 6 and 7 runners for the varsity girls were Maritza Gonzalez (Jr) and Jordan Neal (Fr). Dorantes completed the course with a time of 18:57, just 2 seconds out of 1st place and only 5 seconds off her personal record for the home course. The other six varsity girls all ran personal record times for the Mt. Pleasant course. The race for Varsity Boys was close seeing Sulphur Springs taking the championship with only a 4-point lead over Mt. Pleasant. The Tigers finished 2nd with a score of 48 points. Leading the Tigers was Brian Ramirez (Jr). 4th place, Daniel Robles (Fr.) 8th place, Gill Landaverde (So.) 9th place, Israel Hernandez (Sr.) 13th place, and Martin Ponce (Jr.) 14th place. Completing the team roster was Antonio Landaverde (Jr.) and Hector Escobar (Sr). The JV teams also saw success with the JV Lady Tigers taking 2nd place overall and the JV Boys taking 1st place. 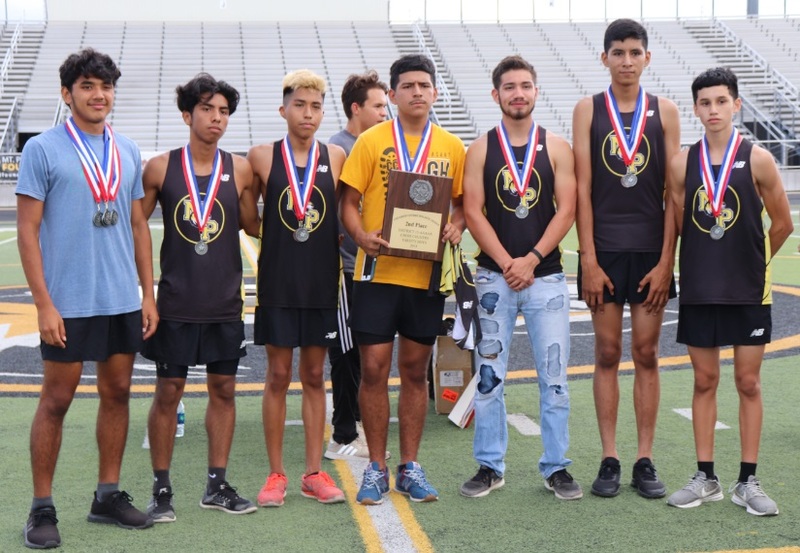 Both the boys and girls varsity teams will advance to the Region II 5A Cross Country meet in Grand Prairie on October 22nd. SimsNEHS: The new members of the Annie Sims Chapter of the National Elementary Honor Society. Annie Sims Elementary School held its National Elementary Honor Society Induction Ceremony Tuesday, October 9. Forty-nine Annie Sims Elementary School 4th graders became members of the Sims Chapter of National Elementary Honor Society before an audience proud family members, teachers, and administrators. Students and audience members listened as chapter officers described the important characteristics of a NEHS member. Vice President Kenlee Jaggers discussed Scholarship, Secretary Anna Beth Sellers explained Responsibility, Treasurer Maggie Price talked about Service and President Sabrina Otero-Svirska discussed Leadership. Guest speaker Buddy Blue, a long-time volunteer at Annie Sims, told the students that he was proud of all they had accomplished. He encouraged them to continue to strive for excellence inside the classroom and in the community. He told them he expected to see great things from them in the future. To be a member of NEHS, a student must meet or succeed the national minimum standard of a cumulative average grade of 85%. Students are also judged on their level of personal responsibility. Once inducted, members are required to maintain the same level of performance in academics and responsibility. NEHS recognizes 4th-grade students for their outstanding academic achievement and demonstrated personal responsibility. The organization seeks to provide meaningful service activities for students to both the school and the community and to develop essential leadership skills in elementary school students. 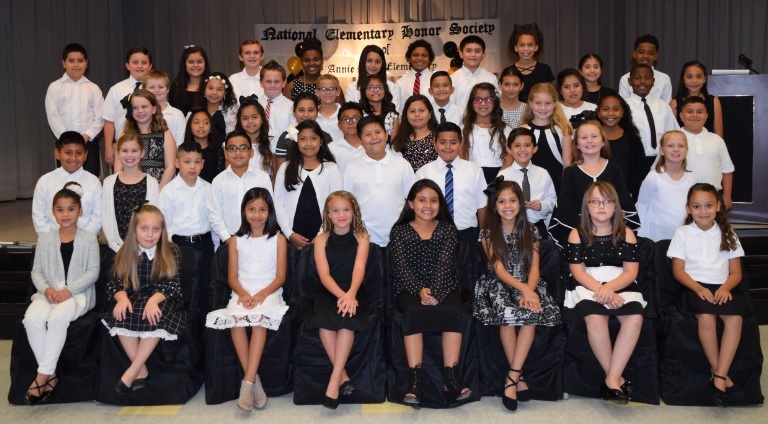 New members of the Annie Sims Chapter of the National Elementary Honor Society are Kevin Alvarez, David Bautista, Mason Brown, Kaelyn Carrillo, Nicolas Castaneda, Landon Cheatum, Zoei Craig, Valerie Cruz, Valeria Cueto, Aileen Flores, Ashley Flores, Monserrat Gonzalez, Yadiel Guzman, Alexia Hawkins, Alexandra Hernandez Rodriguez, Jeremiah Hurndon, Kenlee Jaggers (Vice-President), Adrian Jaime, Mia Jaime, Conley Johnson, Jayla Jones, Daniel Kimbrough, Aloani Laboy-Camacho, Lacen Logue, AJ Lytle, Grace Martinez, Roger Martinez, Jennifer Meeks, Miriam Monroy, Kace Moreno, Joecelyne Ornelas, Sabrina Otero-Svirska (President), Gabriel Palomares, Carolyn Pena, Adali Ponce, Jacqueline Ponce, Charity Prater, Maggie Price (Treasurer), Yazid Ramirez, Cooper Rider, Nicole Salazar, Anna Beth Sellers (Secretary), Jaden Shelley, Isaiah Shepherd, Adan Torres, Nitalya Trimble, Janel Vega, Brooklyn White, and Amiyah Willis. The new members of the E.C. Brice Chapter of the National Elementary Honor Society. Seventeen E.C. 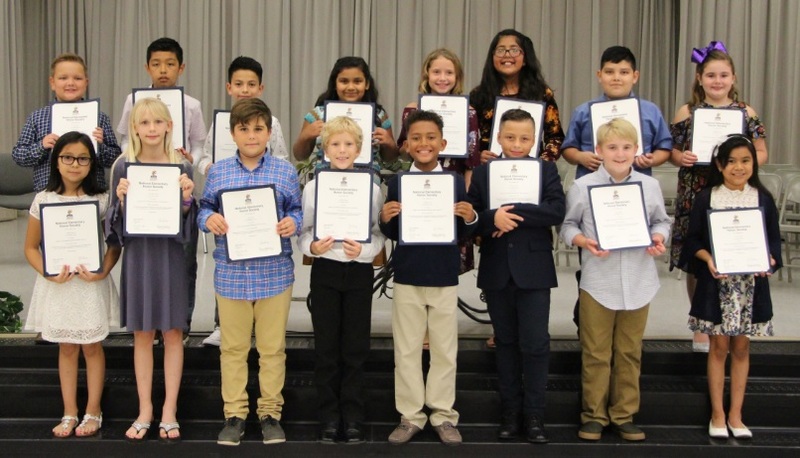 Brice Elementary School 4th graders became members of the National Elementary Honor Society as the Brice Chapter held their induction ceremony on October 8. Students and audience members listened to an explanation of what it means to be a member of NEHS. Chapter officers described the important characteristics of a NEHS member.